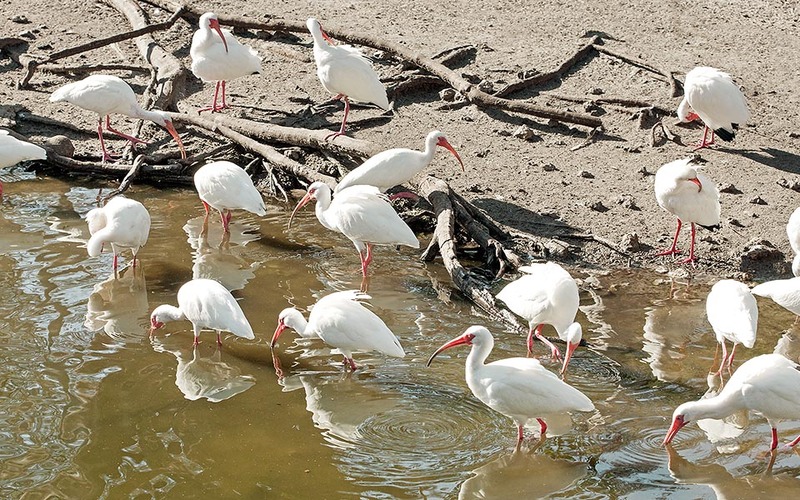 The American white ibis (Eudocimus albus Linnaeus, 1758) belongs to the order of the Pelecaniformes, to the family of the Threskiornithidae and is one of the only two species assigned to the genus Eudocimus, the typically American ibises. Two very common birds and in the mean time much different from each other and recognizable at first sight by all who observe them. It is not necessary to hold a lot of scientific knowledge to distinguish them as the Eudocimus albus is snow white and the l’ Eudocimus ruber is completely red. Moreover, the territory is overlapped only in a reduced area and so it is not even common to see them together. However, recent studies confirmed by sightings in nature, relate of hybridization among the two species reconfirming old ideas that deemed the two birds belonging to one unique species. Nothing new, seen the ongoing taxonomical revolution of these last times. In the ornithological field they have invented two nicknames that identify the followers of the different taxonomical currents, the lumper, that is he who wants to group indiscriminately in only one group heterogeneous subjects, more brutally said “to collect indiscriminately” and the splitter that, conversely, wants to make even more clear distinctions between the two species. Lumpering and splittering are the names of the two currents. Yore, the American natives loved to live close to the numerous colonies of these birds in order to get food, because they felt their meat delicious like the shrimps of which they nourished. Others found it disgusting rightly due to the taste of fish imbuing their meat, however still now in some corners of its range they are always object of catching. In the local tradition it is believed that this bird identifies the courage and the strength because it is the last bird to shelter before the arrival of hurricanes or of tropical storms. 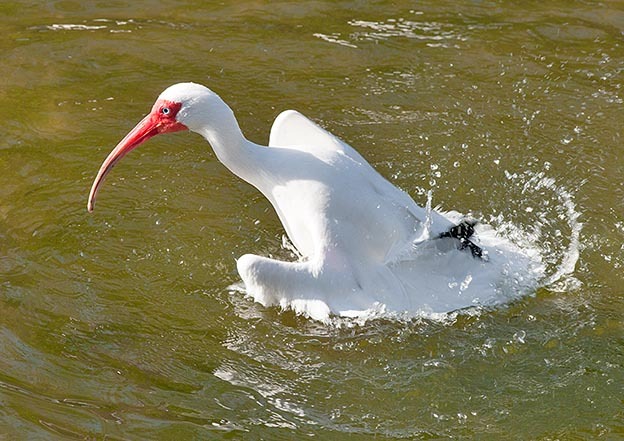 A little anecdote concerning the American white ibis, is an event that will remind its vulgar name in the history of the American sport for long. The Miami University in 1927 wanted, at the end of the first year of competitive activity, to call its mascot for its own athletic events “The Ibis”, later on become “Sebastian the Ibis”, a dummy that still now accompanies all sport activities where is involved a team of this Institution. The etymology of the genus Eudocimus comes from the Greek “eudokimos”, merging of the two terms “eu” = beautiful, nice and “dokimos” = esteemed, excellent with the final meaning of glorious/important, whilst the name of the species albus comes from the Latin and simply means white. Still now in their area of diffusion the two ibises have simple vulgar names and very identifying: le flamant for the red, and the bec croche for the white, besides chiurlo spagnolo (Spanish curlew), chiurlo bianco (white curlew), mangia gamberi (shrimp eater) and others in Italian. Other common names are: in English, White ibis; in German, Schneesichler; in Spanish, Corocoro blanco; in French, Ibis blanc and in Portuguese, Íbis-branco. 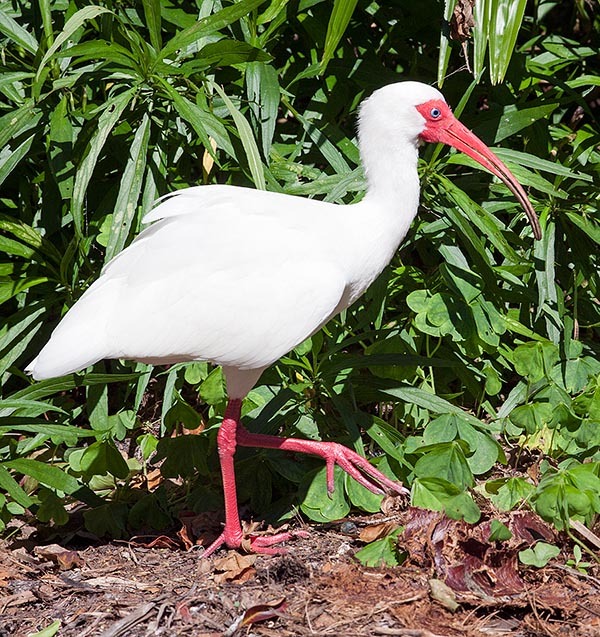 Typically American bird, the white ibis lives in the tropical area surrounding the Caribbean Sea, from the southern coasts of USA up to North Carolina on the Atlantic siden and on the Pacific, from Baja California up to Ecuador. It lives in all Caribbean islands, Venezuela and Colombia, but is absent in the Guyanas and in Brasil, where is replaced by the Scarlet ibis (Eudocimus ruber). In Venezuela and in Colombia stands the point of contact of their territories, with overlapping of the relevant ranges. The Venezuelan Llanos and the Everglades in Florida are two important strongholds of their populations. It is a sedentary species, excepting the northernmost populations that are subject to short movements southwards during the dry season or when the temperature tends to drop. Typically coastal bird, during the post productive period it performs errations towards the hinterland and the Caribbean islands, colonizing temporarily areas that are later on abandoned to go back to the native places. The white ibis lives in swampy areas, mangrove woods, shallow coastal lagoons but also flooded and muddy lands with relatively shallow waters. Usually it choses habitats close to the coast or very extended swampy areas, but the important is that the level of the water is deep enough to allow two essential conditions. A height not exceeding the length of its neck so as to allow it the type of fishing it performs and not under the level necessary for the survival of the crustaceans it nourishes of. Too deep waters or, conversely, too dry marshes are not the best for this bird. The swamps are normally bushy and spread of trees, suitable therefore to the nidification when the moment comes as well as to furnish a safe shelter for the night and in the moments of daily rest. The American white ibis has a strong bill, slightly curved in the final part, more than 20 cm long, much more pronounced in the male than in the female. It has a nice vermilion colour with blackish final part and together with the pink legs give the only note of colour to the livery of this bird which is almost completely white. Only the tips of the first four primary remiges are jet-black, so that when the wings are closed the bird looks totally white. On the cheeks the adults have two featherless areas of the same colour as the bill and that emphasize the wonderful straw yellow eyes. During the nidification period all coloured parts become of a brighter and livelier colour that will last for some weeks until the end of the nuptial time. There is a slight sexual dimorphism also in the size where the female results being about 20% smaller. On the contrary, the young have a totally different colour and may often be mistaken with two species cohabiting with them. During the first months the livery is greyish but it gradually clears up with the age to reach the typical one of the adults. It is difficult in this juvenile phase, to distinguish it, in the areas where they cohabit, from the Scarlet ibis (Eudocimus ruber) and also from the Glossy ibis (Plegadis falcinellus) but quite soon after few months highlight liveries rather different from each other that render easy the distinction. 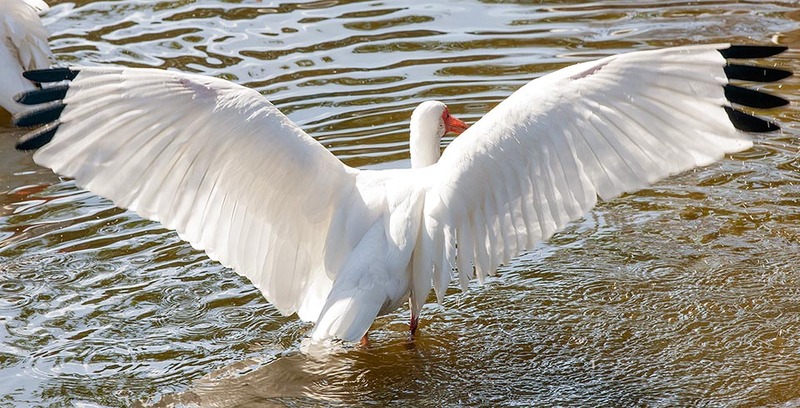 The dimensions of this bird are averagely similar to all the world ibises witb a length of 70/100 cm, an average weight of 0,8/1,2 kg and a wingspan of 100 cm. Like all ibises, also this bird flies keeping the neck well ooutstretched and when in flock flies in the typical V formation. The white ibis is a highly social bird and rarely is observed alone during the research for food as well as during the transferring flights. It nidifies once a year, in colonies also mixed with ardeids, in places now occupied since remote times and often these populations form very numerous groupings at times even of some thousands of specimens. 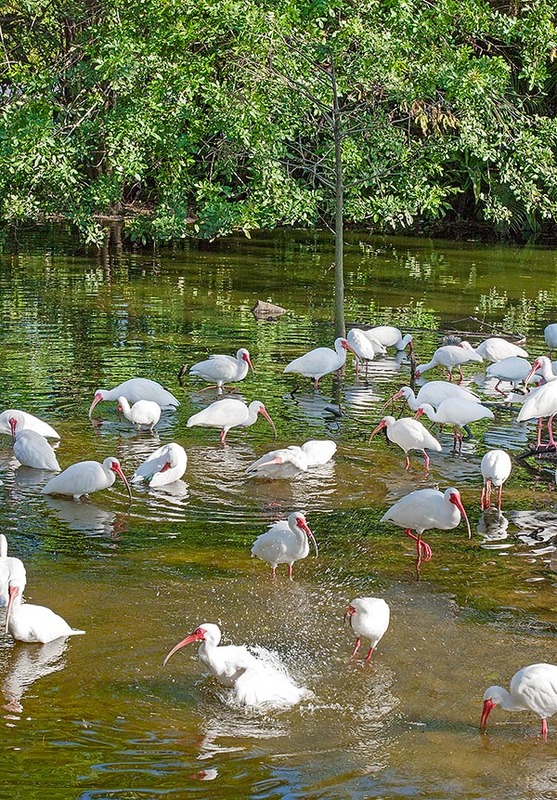 Albeit typically monogamous species, the white ibis is thought to practice a polygamy within the colony, conquering other females although being already coupled with other partners in order to achieve a bigger reproductive success. The nest is placed on low branches of bushes of close trees or directly on the water and is a messy platform formed by small branches of various size, often already used over the years after a short and simple upgrading done by the female, with the male carrying the material to the nest. It lays usually 2 to 5 eggs, averagely 3, of pale green colour dotted of ochre, in number varying in function of the availability of food present in the zone and that are brooded mainly by the female for about 3 weeks. During this period the male stays always in the colony to survey the nest and its partner, defending them against any attack or disturbance of its consimilars or of external aggressors. It’s a quite hard time for the male that in order to perform its duty never leaves its place fasting and often getting hopelessly weak. The chicks are born covered by a slight dark brown down that will be kept for a twenty days and that will be lost at the same time of the growth of the real feathers, dark too. The bill is accentuated but rather small if compared with that of the adults. Both parents alternate in the care of their progeny keeping always a look out of their chicks. As a matter of fact, there are many dangers impending on the colony, formed by raptors and hawks that keep close to this storeroom during such period. The mortality rate during the first weeks is fairly high not only due to the aerial aggressors, especially the Fish crow (Corvus ossifragus) that appears having specialized in this task but also due to those chicks that while moving fall into the underlying water infested by other types of much more toothed and aggressive jaws. The raccoons, the opossums and some snakes complete the ranks of their numerous foes. In any case the perfect synchrony in the deposition of the eggs and of the cycle of reproduction of the colony, minimizes the impact of these predatory catchings. The young reach the adults’ dimensions around the second year whilst the sexual maturity is gotten only on the third one. he feeding of this bird is various and consists in all what edible can be found in the water. Small fishes, molluscs, amphibians, small reptilians, insects but especially the shrimps (Procambarus sp.) that form most of their diet. 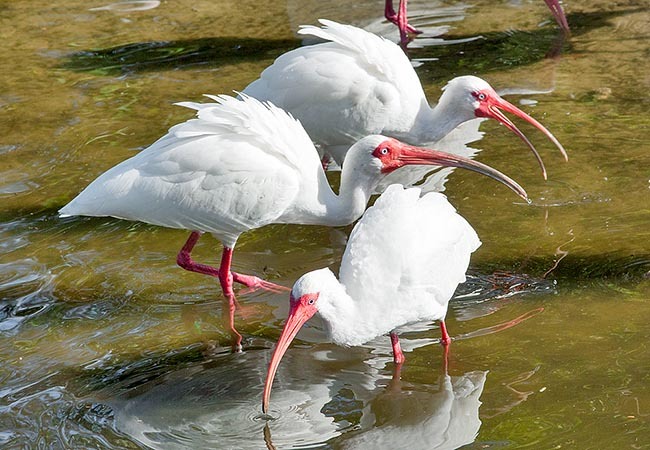 The American white ibis is quite silent and rarely emits sounds or songs outside the reproductive period. It sends a hollow sound, serious and throaty in particular when still in the nest, for urging the food from its parents. It is very common in its range and is not subject to particular protection being not an endangered species. It is assumed that this bird has an average life of 15/20 years.